The most extensive variety of hairstyles that you can find online is that of toddler hairstyles. There are plenty of hairstyle options that can be tried out on toddlers and most of them look seriously gorgeous. Toddlerhood is the time when you have all your attention on your beautiful little soul, and that’s precisely when you want to try something new with him every day. So, you want to make sure that you pick the unique dresses, give him a beautiful hairstyle and try everything in your power to make him look as chic as ever. Well, that being said, here we have outlined some of the best toddler boy haircuts that both you and your little guy will adore for sure. From a punk look to beautifully textured hairstyles, you have everything on the list. All you have to ensure is that you pull the right strings to give something special to your little one. For those rebellious souls, this beautiful hairstyle is a more than perfect choice. It will make him look the same from outside what he is from the inside. The hairstyle requires longer bangs on the sides to be paired with the parties that are closely shaved for achieving an edgy look. You can always experiment with the look in whatever way you like as there are endless possibilities available. For those beautiful kids who have natural curls on the top, it’s all the easier to get their hair in style because there are entirely a few haircut options that work perfectly for such hair types. Cutting the hair close their roots would be the best choice allowing the locks to express them to perfection. The hairstyle works best with medium to thick hair. For achieving better looks, those natural curls can be further enhanced with the help of a quality gel. 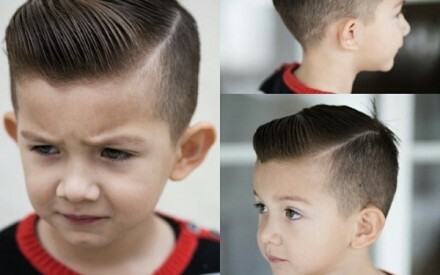 When you can style short haircuts to perfection, they look cool on toddler boys. A neat example of that is an edged out hairstyle that is buzzed in and doesn’t require too much of styling. Giving it an exotic touch, the hairstyle can be added with some detailed lines. It is a beautiful short haircut for boys that is usually appreciated more by the busy moms than anyone else. The simple reason is that they won’t have to spend too much of time daily on giving a sharp look to their little one. This no-fuss hairdo involves keeping the locks short on the back and the sides while the hair on top is kept a bit longer. Just make sure that your boy gets the haircut right and use wax or pomade for styling the hair and achieving a perfect look. This hairstyle can be achieved with the generous application of some texturizing lotion on hair and then brushing it all forward from the crown and sweeping everything to the sides. It is a perfect hairstyle for kids having oval or square faces. Usually worn by the adults, this hairstyle looks even better on toddlers when styled with beautiful bangs. Getting it right, make sure that you keep it whimsical by merely leaving naturally shaggy locks and long layers around his ears. Let the textured bangs fall above the eye to ensure that his beautiful eyes are still visible. It’s a medium-to-thick hairstyle that suits perfectly to boys who have lovely texture in their hair and round faces. Keeping it high on top always makes the beautiful little souls look outstanding. It is especially so when you show your creativity with the hair on the head. The hairstyle features lots of texture that will surely make him look adorable than ever. For achieving the look, the hair on top should be swept forward while those on the sides should be combed back. Apply some stronghold styling product and achieve texture by roughing it up and adding a bit of definition to the look. So, if you are looking for toddler boy haircuts that your little boy can wear this year and beyond, you can choose any of the above options, and he will surely look great in it. All you have to ensure is that the hair is cut right to achieve a perfect look.